An in-form Mumbai will be raring to go against a struggling Rajasthan in match number 27 of the Indian T20 League at the Wankhede Stadium in Mumbai on Saturday. Mumbai is having a great streak having won their last three games. In contrast, Rajasthan has been all over the place, managing just one victory so far. 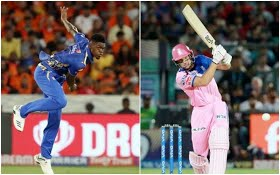 Although Mumbai was dealt a big blow losing Rohit Sharma to injury, Kieron Pollard did a sensational job as the leader against Punjab, smashing 83 from 31 balls, one of the most dazzling innings in the league. There was good support from Alzarri Joseph, who kept a cool head towards the end. Following a smashing debut with 6 for 12, Mumbai really would be pleased with Joseph's inclusion. It remains to be seen whether Rohit recovers in time for Saturday's match. Apart from him, Pollard and Joseph, Mumbai would continue to have high hopes from the rest of the players. The Pandya brothers -- Hardik and Krunal --, as well as Quinton de Kock and Ishan Kishan, have all shown the ability to perform. For Rajasthan, things just seem to keep getting worse. They went down to Chennai in the last over, in the game that included a controversial no-ball call after which Mitchell Santner hit the last ball for a six. Apart from Jos Buttler, nobody really has looked threatening. Rajasthan need the trio of skipper Ajinkya Rahane, Steve Smith and Sanju Samson to perform better. In the bowling, the Rajasthan would be pleased with the effort of Jofra Archer, who has constantly kept the runs down. Shreyas Gopal has been among the other success stories with the ball. However, the performance of pacers Jaydev Unadkat and Dhawal Kulkarni has been extremely disappointing.